Editor’s note: This is the seventh in a 14-week series of first-person accounts of the highly popular Hilliard Division of the Police Citizens Police Academy. When I started the Hilliard Citizen’s Police Academy, firearms night was the class I was looking forward to the most. I have to say, it did not disappoint. Week seven started with food donated from Louie’s Grill. Then, class was split into two – one half of the students started in firearms and the other half started in criminal investigations. Next week, the halves will flip. The firing range, located in the basement of the Safety Services Building, isn’t large enough for all of us to get through this portion in one night. I was in firearms this week. We started by reviewing some safety rules. I had experience with firearms before the class, so some of it was review for me, but it was nice to get the perspective of a police officer on the topic. do not point the weapon at anything you are not trying to shoot. We learned about how bullets are designed, how bullets work and how a gun fires. We practiced with some training weapons on aiming, stance, etc. An important portion of the classroom time was spent discussing statistics about officer-involved shootings. 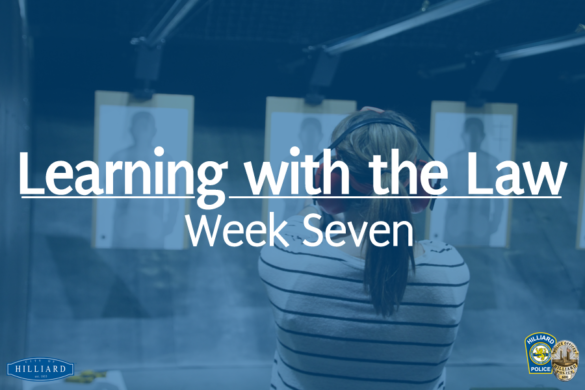 In our Week 5 blog, I said no officer ever wants to use deadly force, and was reinforced in this lesson. Due to the nature of the job, and especially the trauma following a shooting (whether the officer is the victim or the responder,) an officer’s mental health and personal life are affected tremendously. Even in a situation where an officer is completely justified, the stigma following a shooting can eat away at a person. Officers involved in shootings often end up leaving the police force. It’s important to remember this when you see a news headline about a police-involved shooting; nobody wants to have to make that decision, but the officer’s life is on the line. After the classroom lesson, we moved to the firing range. HPD is fortunate to have an in-house range, and the agency emphasizes regular firearms training. I’ve been to a few ranges in my life, and knowing they have such a great resource tells me they care a lot about training. We had plenty of supervision with several police officers and safety officers with us the entire time. While using the range was really cool, the officers placed a lot of emphasis on the serious nature of using firearms. We each got a chance to shoot 30 rounds. The targets (which we got to take home) were marked where you should aim, mostly in the chest area. We learned quickly that it’s unrealistic when you see someone shoot a gun out of someone’s hand or shoot someone in the knee cap in the movies. Even as an experienced shooter, it’s difficult to get a perfect shot in a calm environment where you are focused with no distractions. In a stressful moment, forced to make quick decisions and fearing for your life, it is borderline impossible to shoot that accurately. That’s why you aim for the largest part of the body. During these exercises, we talked a lot about using deadly force, and I experienced what a real-life situation might feel like. My adrenaline was pumping, even though I knew I was in a pretend situation. I can’t imagine what it feels like out in the field. Every class so far has really given me a perspective on how difficult it is to be a police officer. This class showed the effect that shootings have on officers and their mental well-being, and spoke volumes to me how much officers sacrifice to protect total strangers.